Anticipating dire economic straits for 2019, Azione chairman Richard Glikes urges home-tech integrators to embrace lighting and wellness, and to get aggressive on workforce development and marketing. Azione Unlimited holds Fall 2018 conference in Denver, with more than 200 dealer members on the roster. Last month, the home-tech buying group Azione Unlimited held its annual fall conference, this year in Denver. But it wasn't just any ol' Azione conference. It was the first to convene since the group clinched its 200th dealer member in September. 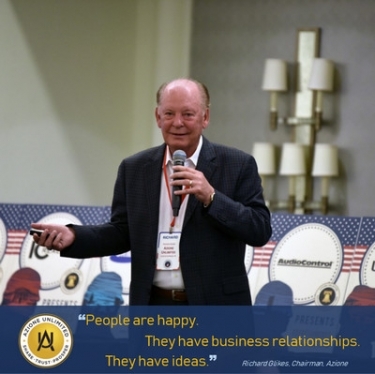 Only 50 more dealers to go, and Azione chairman Richard Glikes will have reached the 250-dealer goal he announced in 2012 at the first Azione conference in St. Louis. At that time, one year after founding the organization, he had recruited 46 dealer members, along with several marquee vendors. And buzz there was. As usual, the event featured roundtable discussions, dealer success stories, team-building fun, and good food and libations. This time around, though, Glikes added a series of 20-minute talks, or “Inspired Inspirations” in Glikes speak, covering everything from the relationship between technology and design (Barco’s Tim Sinnaeve) to the idiocy of customers (BDX’s Tim Costello). "I'm a builder," says Azione founder Richard Glikes, on recruiting 200 dealers to the organization. Integrators should stretch their comfort zones, moving into newer product categories to grab more business. “The lighting designers love you and hate you, probably at the same time ...."
Glikes highlighted a few of the more promising categories, including lighting, power storage and management, and wellness solutions. He tells CE Pro he’s looking at a few options for power storage systems – companies like Tesla, Sonnen and Rosewater energy, to name a few – but hasn’t yet brought a vendor into the group. Most immediately, Glikes and team are pushing new lighting opportunities, including fixtures, tunable white and low-voltage LED systems – represented at Azione by Lumastream, Coastal Source, Wolfers Lighting and USAI. Earlier this year, home-automation provider and Azione vendor Savant teamed with light-fixture manufacturer USAI to offer end-to-end LED solutions from fixtures to controls to project design tools. USAI’s Ann Schiffers spoke at Azione about the importance of human-centered lighting (HCL) – delivered through tunable white fixtures – to regulate circadian rhythms for wellness, productivity and other health benefits. So do we. CE Pro will cover Schiffers’ insights in a “wellness” feature coming soon. If there is one thing everyone in the industry is talking about these days, it’s the labor crisis – including a shortage of labor, as well as a “different” work ethic among Millennials. Speaking about the dire situation, Glikes promised to work with dealers on fresh approaches to workforce utilization. He invited Kathleen Brenk, VP of human resources for TruStile Doors, to speak about the subject as part of the “Inspired” series. Poor lady (as she joked) had to follow Jason Romero’s presentation, “Transform your Dreams into Reality,” in which the blind ultra-athlete spoke about losing his vision, becoming the only blind person to run across America, earning a law degree and running a $400 million division of GE. Still, Brenk had dealers fully engaged, and nodding their heads vigorously, during her HR presentation. TruStile HR exec Kathleen Brenk laments the middle-skills labor gap. She painted a scary statistical picture of the vast number of “middle-skilled” jobs available versus the paltry number of workers available for this class of employment. She blames the disparity, in part, on America’s over-emphasis of four-year degrees and (when everyone had four-year degrees) advanced degrees like MBAs. Brenk suggested a slew of non-traditional hiring places and practices for finding or developing mid-skilled workers. The biggest takeaway from her presentation, however, was the suggestion that managers conduct regular “stay” interviews with employees. Employers are great at conducting exit interviews when a worker leaves, but it’s more important to keep them in the first place. CE Pro will share more of Brenk’s insights in an upcoming feature about the labor market. The economic bubble is going to burst soon, Glikes warned. He urged dealers to get ahead of the certain slowdown by shoring up their websites and social presence. Helping with that visibility is One Firefly, an Azione partner that provides marketing services for the channel. When attendees received their individualized report cards, some wept. But One Firefly’s Ron Callis presented some very simple fixes – little things like putting the dealer’s location at the top and bottom of the website. “Do they [visitors] quickly know you service their community?” he asked. Besides the challenging labor market and the sad state of dealer websites, Glikes had plenty more bad news to share at the conference – slide after slide of bad news: housing shortages, impending inflation due to tariffs, wage hikes, locusts, the plague “and here’s another slide showing a lot of bad news,” he said rushing by it. On top of the broader economic challenges, Azione the organization was hit with a double whammy because dealers weren’t growing their sales enough with Azione vendors. Year-to-date, dealer purchases from vendor partners were up less than 11% over the previous yea. “I’m not happy with the growth,” Glikes said, imploring dealers to drop three non-Azione vendors while adding three new Azione vendors to their line cards. Dealers shuddered in their seats. Glikes often reminds dealers that Azione keeps its vendor roster small to provide more concentrated revenue streams from dealers. In return, vendors provide generous support to the group and individual dealers. Azione currently has about 50 vendors supporting roughly 200 dealers. Sometimes I say ridiculous things in articles just to see if anyone’s paying attention. Looks like you caught the bit about locusts and plagues? Dude, that was Ghostbusters. Come on now!